Stones and crystals have been used since time began to remedy ailments and to protect one from negative spirits. You can do the same. All you need after choosing your stones is a small pouch to carry your gemstones in. Simply string it around your neck or waist to wear your stones close to your body and hold the energies close to you. You'll discover which stones to use for various maladies directly below under A Stone for What Ails You. To discover stones and crystals that correspond with your zodiac sign, see the second section of this page under Gem Stones for the Zodiac Personalities. And, for gemstones for the chakras, view the third section of this page under Gemstones for the Chakras. Malachite - Protects you from harmful electromagnetic frequencies (EMFs) and other forms of negativity. It also refreshes stale relationships. Turquoise - Lends expression, helps with anxiety, and is healing in general. Aquamarine - Harmonizes energy, helps one to be more communicative, and helps with a toothache. Amazonite - Reduces the effect of harmful cell phone transmissions. Fluorite - Is calming. Tones down harmful computer EMFs, helps with colds and flu, and promotes mental attunement. 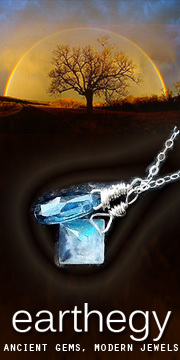 Blue Sapphire - Stimulates the mind and aids in directing you on your spiritual path. Flourite - Is calming. Tones down harmful computer EMFs, helps with colds and flu, and promotes mental attunement. Amethyst - Increases compassion and clairvoyance. Prevents constant interruption. Helps with "treating" alcohol addiction and ADD/ADHD. Promotes more content relationships. Opal - Increases money and emotional clarity. Fosters commitment. Sugilite - Banishes jealousy (yours or theirs). Garnet - Balances emotional disharmony. Relieves sexual problems. Encourages physical strength and assertiveness. Ruby - Relieves sexual problems and increases spiritual passion, health, and strength. Jasper - Relieves trauma, increases energy, and helps with skin wounds (Red Jasper). Carnelian - Increases energy. Helps to attract others when lonely. Physically grounding. Blue Kyanite - Reduces frustration on the job. Rose Quartz - Purifies the energy of house and home, heals emotions, opens one to love, helps with an earache and sleep disorders, soothes a broken heart, and promotes emotional balance. Adventurine - Assists in letting go of an unhappy relationship, energizes a sluggish mind, and is very healing in general. Rhodochrosite - Attracts a soul mate. Agate - Increases success and happiness. Secures the home and helps with physical and emotional balance. Chrysocolla - Releases a past lover, helps with stress and feelings of hatred. Citrine - Relieves menopausal symptoms, helps with menses, increases personal power promotes happy relationships, livens the atmosphere, mental clarity. Amber - Helps with a stomach ache and a headache, protection, and healing. Carnelian - Helps to relieve physical pain, physical grounding. Blue Celeste - Enhances self-expression. Jade - Increases money, is restorative, and increases luck, fortune, healing, and wisdom. Opal - Fosters commitment and emotional clarity. Blue Moonstone - Helps one deal with confrontation, PMS (particularly cramping), balances energies, and relieves insomnia. Adventurine - Energizes a sluggish mind and helps with healing. Chrysocolla - Helps to release a past lover, as well as stress and feelings of hatred. Pearl - Raises energy levels. Emerald - Balances and aids spiritual healing. Rock Crystal - Creates inner harmony, balances emotions, deflects negative energy, gets rid of fear, and reduces cell phone EMF stress (place by your phone). Chrysoberyl - Eliminates negative thinking. Topaz - Reduces tension, anxiety, and relieves constipation. Promotes seeing the "bigger picture". Gold Topaz - Represents expansion and knowledge and helps you to achieve your goals. Tiger’s Eye - Increases money and fortune. Citrine - Relieves menopausal symptoms, helps with menses, increases personal power, promotes happy relationships, enlivens the atmosphere, and increases mental clarity. Jasper – Comforts (in the case of trauma), helps with skin wounds (Red Jasper), and increases energy. Carnelian - Helps with physical pain and grounding. Tourmaline - Used for protection, balance, purification, and healing. Green Tourmaline helps to revive plants. Smoky Quartz - Known for assisting with spiritual attunement as well as restoring connective tissue. Jade - Luck, fortune, money, healing, and wisdom. It also has restorative powers. Blue Star Sapphire - Represents devotion and spirituality. Helps you to follow your personal spiritual path. Chrysocolla - Helps to Release a past lover and cope with stress and feelings of hatred. Hematite - Reduces anxiety, aids sleep, relaxes muscle cramps and tension, and shields the entrance to your home. Fluorite - Calms the nerves, tones down computer EMFs, helps with colds, flu, and mental clarity. Tourmaline -Balance. Black Tourmaline for protection. Green Tourmaline revives plants. Obsidian - Helps to prevent and relieve phobias. It is grounding. It also harmonizes hallways. Garnet - Reduces sexual problems, balances emotions, and increases physical strength and assertiveness. Topaz - Helps with tension. Promotes sleep, expansion, and knowledge. Golden Topaz will also help you to achieve goals. Relieves constipation. Citrine - Increases personal power and mental clarity and enlivens the atmosphere. Lapis Lazuli - Increases spirituality, focus, concentration, and connection with inner wisdom. Obsidian - Helps with phobias and getting grounded. It also harmonizes hallways. Adventurine - Helps to let go of unhappy relationships, energizes a sluggish mind, and heals. Apatite - Helps to relieve sorrow. Onyx - Helps alleviate phobias. Agate - Success, happiness, balancing, secures the home. Mother of Pearl - Helps with raising energy levels. Black Pearl is an alternative. Tourmaline - Balance. Black Tourmaline for protection. Green Tourmaline is used for reviving plants. Moss Agate - Success and happiness in general. Helps to prevent and protect against accidents. Clear Quartz Crystal, Amethyst (deep Violet), Fluorite, Clear Diamond, Rock Crystal, Sugilite, Onyx, and Opal. Healing Benefits: Calms anxiety, insecurity, and helps one feel connected to others. Lapis Lazuli, Moonstone, Sapphire, Clear Quartz Crystal, Dark Blue Kyanite, Charoite, Tanzanite, Sapphire, Blue Adventurine, Sodalite, Sugilite (rich purple), Purple Fluorite, Dumortiete, Sodalite, Diamond, Jet, Jade, Falcon's Eye, and Rainbow Fluorite. Healing Benefits: Helps one sleep, gets rid of eye strain (and related headache) and blurry vision, and calms nervousness. Blue Sapphire, Lapis Lazuli, Blue Lace Agate, Blue Topaz, Blue Chalcedony, Blue Calcite, Blue Opal, Aquamarine, Sapphire, Celestite, Blue Kyanite, Angelite, Celestite, Blue Tourmaline, Turquoise, and Nephrite. Healing Benefits: Helps with coughs, sore throats, and the inability to speak up. Moss Agate, Green Aventurine, Olivine, Emerald, Lapis Lazuli, Rose Quartz, Malachite, Pink Kunzite, Pink Opal, Rhodochrosite, Jade, Rhondonite, Chrysoprase, Pink Rhodonite, Rose Quartz, Green/Pink Tourmaline, and Pink Coral. Healing Benefits: Relieves palpitations, soothes raging emotions, and assists in ridding the body of lung infections. Golden Topaz, Yellow Amber, Yellow Citrine, Golden Tiger Eye, Yellow Aragonite, Yellow Calcite, Rhodonite, Apache Gold, and Yellow Jasper. Healing Benefits: Relieves stomach problems (especially for those who carry their feelings in their gut), helps with digestion, and corrects eating disorders. Carnelian, Tiger Eye, Orange Amber, Sunstone, Malachite, Peach Aventurine, Yellow/Golden Topaz, Orange Agate, Yellow Jasper, Carnelian, Moonstone, Yellow Fluorite, and Citrine. Healing Benefits: Relieves female problems (PMS, infertility, etc. ), helps relieve painful sexual memories, and increases productivity. Red Garnet, Red Ruby, Red Jasper, Red-Brown Tiger's Eye, Red Coral, Hematite, Black Onyx, Obsidian, Bloodstone, Smokey Quartz, and Jet or a plain black pebble. Healing Benefits: Relieves aching bones, physical stress, and lower bowel problems.